Yakitori is a Japanese dish and a very popular Anju dish served in Korean bars. It consists of chicken, vegetables and seafood on bamboo skewers, grilled on charcoal and smothered in a sweet soy sauce. Any part of the chicken can be used (except for its head) but I’ll only use breast!. Nowadays, there are thousands of Japanese restaurants in Korean and thousands of Korean restaurants in Japan. However in the past the traditional enmity and outright hatred between the two nations extended to discriminating against each other’s food and those that ate it. For example in Japan, Korean kimchi became a symbol of racial prejudice for those Koreans living in Japan from after the First World War when Korea became an oppressed colony of Japan. Since traditional Japanese cooking does not include garlic the smell of Kimchi (which does) was very easily detected. So when Korean people walked through Japanese communities, the Japanese called the Koreans “Chosen-zuke” meaning “Korean pickles” the intent being to infer that they reeked of garlic. So Koreans felt racially abused and this phrase was used in schools in Japan to bully young Korean students in those times. But today, Kimchi is one of the most favourite dishes for the Japanese and they even started to sell their own brand called “kimmuchi” which is how the Japanese badly pronounce the word “kimchi”. Such irony! But all this is history … I love Japan and Japanese food, especially Yakitori! Slice the tofu into bite size chunks and sprinkle them a pinch of salt and of black pepper. Pan fry turning to cook all sides until their colour is golden. Cut the leeks, peppers and baby sweet corn into bite-sized pieces. Boil the only the baby sweet corn for 50 seconds and then drain. Cut chicken into bite-sized pieces. In Korea it is usual to keep the skin on but I prefer to remove it. Sprinkle salt and white pepper and lemon juice on to the pieces of chicken. 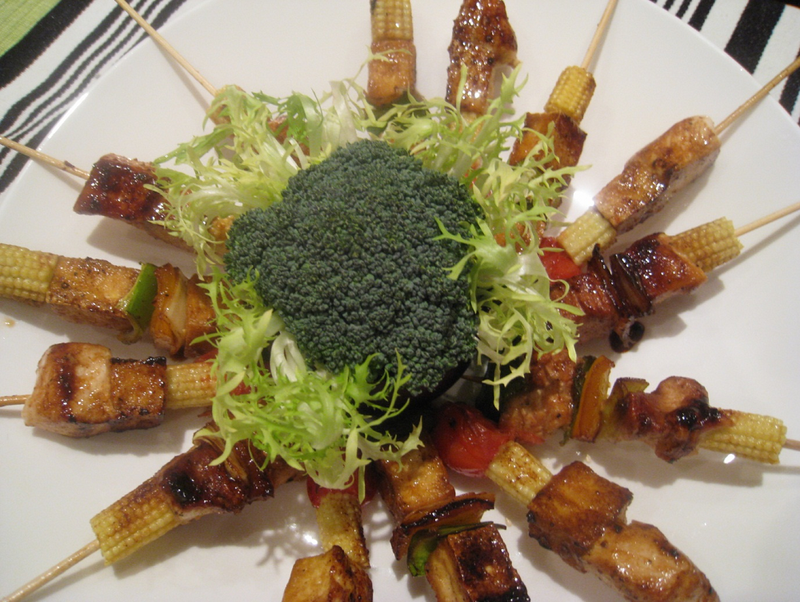 Thread cooked baby corn, chicken, leek, pepper, chicken and leek onto pre – soaked bamboo skewers to make Yakitori. Substitute tofu for chicken to make vegetarian “Yaki”. Cherry tomatoes are a nice addition if desired. Heat a griddle pan and begin grilling the chicken skewers turning on both sides without the sauce. When the meat starts changing colour, brush the sauce on to both sides, and continue grilling. Brush on sauce and turn about 5 times total over 5-10 minutes depending on the size of your meat pieces. When you serve on to a plate, use the reduced sauce from the pan to finally coat. Next Post I am back! Reblogged this on Korean AnJu.